This month, we’ll look at some of RDM Industrial Products’ economical industrial workbenches and other furniture solutions. The Model A-109PE Industrial Workbench above is one of RDM’s most popular industrial workbenches. It’s a light duty workbench with no lower crossmember supports, but it’s still tough thanks to its durable, fully-welded steel construction. It supports many, many customization options. 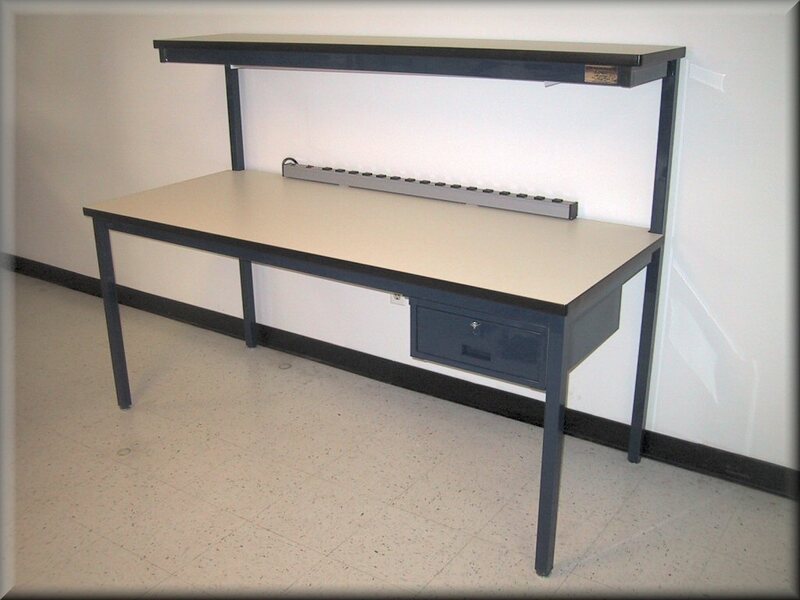 The Model F-103PE Overhead Shelf Workstation is a cost-effective solution for light duty computing. Like the A-109PE, it is greatly customizable – that’s the advantage of buying from the manufacturer. 1P-K Series Static Control Ergonomic Chair shows that you don’t need to sacrifice comfort and safety to stay within your industrial furniture budget. 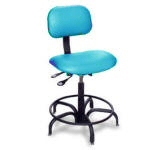 This is a full-featured industrial chair with static-control vinyl upholstery, lumbar support and enough adjustability to suit any member of your staff. These are just a few of RDM Industrial Product’s economy furniture models. If you’re ready to outfit your shop with professional industrial furniture and want to get the best value for your dollar, Contact RDM today! What do RDM’s industrial furniture and the space shuttle have in common? Both of them have landed at White Sands Missile Range. In 2007, RDM was awarded two defense contracts to build furniture and lockers for White Sands. All in all, RDM provided over $22,000 in products and services to upgrade the base’s storage and furnishings. RDM can create custom shapes and sizes for most of its industrial furniture catalogue, along with ergonomic additions to make virtually any workstation more efficient. This is critical in an environment like White Sands, where staff track missiles, aircraft and other high performance technologies. They need industrial furniture that gets out of the way of their workflow – and so do you. RDM Industrial Products is uniquely diverse. Few laboratory and industrial furniture manufacturers have so many products and capabilities under one roof. That means RDM is capable of not only providing furniture that stands up to extreme stress from heavy loads, heat and chemical reactions, but they can also provide lab tables and other furniture to satisfy cleanroom quality controlled environments. With RDM, you never have to choose between the ideal and convenient solution – RDM Industrial Products provides both, so that you can order industrial furniture that creates the exact environment you need from one source. RDM secured the White Sands contract because they provided the best value. RDM’s manufacturing and sales are under one roof, so there’s no need to pay a middleman. RDM manufactures most of our products on site, minimizing reshipping costs that they would otherwise have to pass on to our customers. Please Contact RDM for your Industrial or Lab Furniture needs. See the difference that a complete solution provider makes.